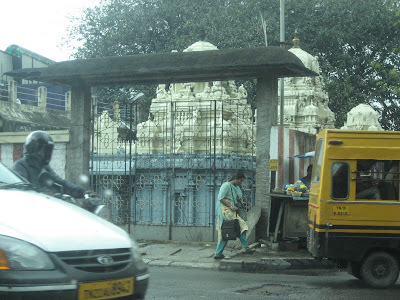 Cars in India drive on the left-hand side of the road. The Virgin Islands is the only place where I have experienced this. It's hard to get used to. I've been driving since I turned 16. It's an instinct to look for traffic coming from the left. When I see cars coming from the right I feel a moment of panic, even as a passenger. 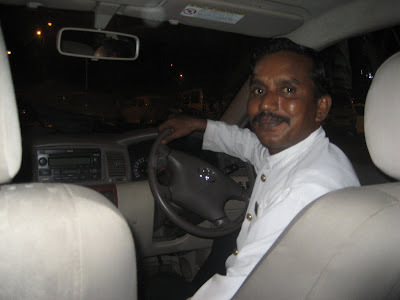 My driver from the airport to my hotel just before he donned a pair of white gloves. I don't feel this way much at all. I am not worried that someone will crash into us. I am scared that we might run into a pedestrian, a bike rider or a motorcyclist. My best description of driving in Chennai is chaos just barely tempered by the notion of possibly killing someone else or getting oneself killed. Drivers more or less do what they want. Vehicles are engaged in a constant struggle to squeeze into the smallest available space available on the road. Someone eventually yields to someone else, but it always seems to come to a matter of less than an inch between vehicles before someone relents. Traffic is frightening, but there is a lot to look at to distract you from the danger. Like this temple. Strangely enough, people don't drive all that fast. In New York it is not at all unusual to be driving along and be overtaken by someone driving 20 or 30 mph faster than you. People don't drive at excessive speeds. But driving 35 mph past a bicyclist, leaving a hair's width of space between him and the car seems really dangerous. When I expressed that I was baffled by the way people drive the Indians told me they are used to it. The closest analogy I can think of is how visitors to New York are usually freaked out by traffic there, despite the fact that accidents aren't all that common. The way people drive in New York IS dangerous, even if everyone is used to it. I think the same is true of Chennai.